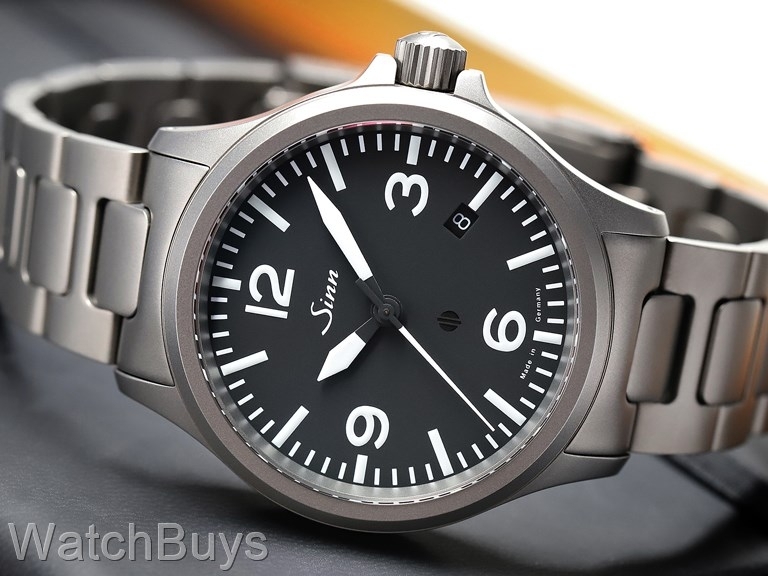 We love this watch, and feel that Sinn got it right by listening to their clients. Sapphire crystal with luminous hands and hour markers. Watch is water resistant to 20 ATM. Bracelet is stainless steel which is fully Tegimented with folding clasp. Verified Owner Comments: I bought the 856A for daily wear in my job as a pilot. It more than fits the bill great esthetics and exceptional build quality. Very pleased with the Watchbuy experience, I highly recommend them. Verified Owner Comments: My husband has been eying this watch for almost a year so I decided to surprise him with it. The watch itself is great, and again my husband did a lot of research on this so we knew what we were getting. He really loved the 856 over the 556. The finish is really nice. The best part about watch buys was customer service, I was hesitant to make such a large purchase on here but I will definitely use them again. They have excellent customer service and are incredibly helpful with any and all questions! Verified Owner Comments: Had my 856 for about 2 weeks now. It was easy to get the bracelet adjusted, runs well at just about +5/6 sec/day. I expect the tegiment treatment to keep the watch looking great for a long time and like the toned-down, utilitarian look of the watch. The high contrast matte dial is easy to read in all light and the watch goes well in almost any situation. Verified Owner Comments: I recently purchased a Sinn 856 from WatchBuys, and I couldn't be happier. The customer service at time of purchase and a follow-up phone call at time of shipping was very much appreciated. The watch is beautiful, and runs great. I'm a very happy WatchBuys customer. Verified Owner Comments: First, let me say that Watchbuys was fantastic to work with. I've never experienced customer service to this level before. Outstanding! As far as the watch is concerned, I'm still on the fence. First off, if you're concerned that the 40mm case might be a little small, then it probably will be. It's not noticeably small on my 7.25 inch wrist, but i think 41 or 42 would do better. So far, over the last eight days, it consistently has gained 6-7 seconds a day. Hopefully it will settle in eventually. The luminescence of the face is pretty much non existent. After most of the day out in the sunlight, it is unreadable at bed time. Lastly, the tegimented finish, while apparently very tough, is also very dark. Not unattractive, but certainly even darker than I was expecting. I'm totally willing to give it plenty of time to settle in and get used to it, but after the first week, I'm not totally sold on it. Verified Owner Comments: This is a great watch and I got great service. A fine addition to anyone's collection. Verified Owner Comments: After wearing my Sinn 856 every day for over a month, I have decided to issue a report card. Possible grades are A, B, C, D or F.
Accuracy (A-) Accuracy is very good. My watch gains 3-4 seconds per day. Bracelet and clasp (C+) Expect the bracelet to rattle and do some occasional hair pulling. Sinn should study the Omega Seamaster bracelet and clasp and produce something similar. The Seamaster bracelet is superior in every way. Design (A) Simple and classy. Well done. Legibility (A) The 856 is easy to read in all conditions. Wearing comfort (B) The large crown has sharp ridges that make setting the time very easy. Unfortunately, those ridges can cause some discomfort depending on the position of the watch on your wrist. Overall grade (B) The 856 is a well made watch with some room for improvement in the bracelet. "Sinn 856 fully tegimented on bracelet"
Verified Owner Comments: I'm a watch guy. I wanted a quality mechanical tool watch to wear for every day use and not have to worry about it. "Sinn 856 Tegimented on bracelet"
Verified Owner Comments: I am rough on watches - my Rolex Sea Dweller and Explorer are good watches but they scratch up easily. I wear a fully Tegimented Sinn - it's great and cannot seem to scratch. It is also easy to read and I like it better, seems just as accurate. Verified Owner Comments: I have had the watch for over a month now and have fallen more in love with it everyday. I live in a fairly humid environment and the Argon inert gas dehumidifier works very well. The watch is lightweight and hasn't started to show any signs of wear or scratching. I am very hard on watches and frequently have to replace the crystal. However, the Sinn rugged design has proved to be the perfect fit for me. I highly recommend the Sinn name to anyone that asks me about the watch. "Best Watch I have ever owned." Verified Owner Comments: This is my second Sinn, I bought the 556i and loved it so much I had to get it's big brother the 856 non-UTC. The watch is superb, fit and finish as good as a Rolex, just without the shiny bling. The tegimented steel is a nice gun metal grayish color, satin finish and feels buttery to the touch. Bracelet adjusts easy and fits well and is extremely comfortable. Out of the box the watch was running +5 seconds a day, and now it has slowed down to +3, that's Chronometer range. I can't think of any of my other watches, Rolex, Omega, Tag, Tissot, Grand Seiko, Citizens that are even close to having the quality bang for your buck that these Sinn do. Verified Owner Comments: I chose this watch because I wanted a tough automatic for every day wear. I wanted good lume, a date function, and an easy-to-read dial. This watch delivers and then some. It's more attractive than I expected and the finish is impeccable. It's the perfect size as it is feels smaller than its 40mm size but doesn't look undersized on my wrist. Accuracy is good at about +5 sec per day, and it's still new. My experience with WatchBuys was first rate and I highly recommend them. The bracelet tapers a bit more than I realized so I ended up switching it for an aftermarket leather band and I couldn't be happier. Verified Owner Comments: Since first receiving the watch it has rarely left the wrist and I own a number of watches. Timing is gradually becoming more accurate, approximately 6+ sec. per day after a week. The tegimented case and bracelet have a unique, appealing appearance and the watch fits very comfortably on my 7 1/4" wrist. The dial is everything it's written up to be: strikingly visible at all angles with a good lume application. My only critique is with the bracelet clasp as I would like to see the ends more contoured to fit flush against the bracelet. This is a minor issue and should not deter anyone from purchasing this model. Verified Owner Comments: Tegimented steel is more flattering in person and less "dull" than I imagined. So far (3 months) it has taken a real beating - bracelet, crystal and all. I can't find one scratch or dent. "Must be seen and held to be appreciated!" Verified Owner Comments: The fit and finish of this watch are excellent. I have had it for just over a week and have worn it daily. The 856 is not too heavy and relatively thin for an automatic, so it wears comfortably (on the steel bracelet). Even as a "simple" pilots watch, others have noticed it, and commented on the watch. The dial is clean and easily read, the Tegimented steel has a brushed look to it that is definitely unique. As expected with the Sinn dual coated crystal, when clean, it is almost like nothing is covering the watch face. Well executed, classic design that has been over-engineered (tegimented steel, antimagnetic, copper sulfate capsule for moisture control and monitoring) by Sinn into a great timepiece.